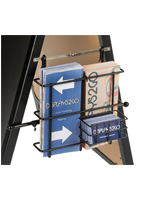 These Sign Supplies are Easy Ways to Advertise! Wood Sign Supplies Online Here! In Stock and Ready to Ship Sign Making Supplies! 24"w x 36" writing board for custom marker messages. This sign supply is double-sided to increase your publicizing abilities. Customers coming from both directions shall be enticed by the exhibited message. To ensure your subject matter sticks out, our company recommends the use of neon chalk wet-erase marker pens. (See related merchandise to the right). 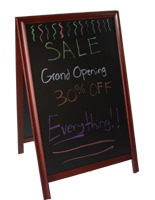 This ready to ship sign supply for sale is an inexpensive, yet effective means to present your daily specials! This sign supply is one of the best ways to advertise at your storefront! 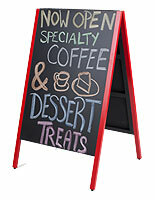 This sign supply, also recognized as a sandwich board, is manufactured from solid wood with a cherry finish. 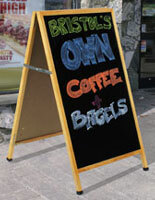 The shiny black marker pen board surface area of this sign supply is made for use with wet-erase markers. 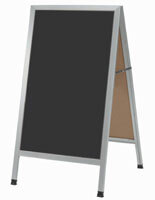 The menu board, sign supply permits you to display daily promotions, menus and notices. A sign supply attracts awareness to your posted ad. 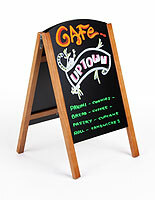 Sign supplies are generally observed in spots like eateries, retailers, shop fronts, bookstores or clubs. 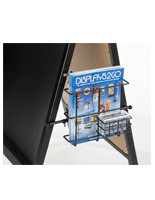 Buy ready to ship sign supplies online and save with wholesale prices! 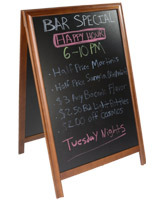 Please Note: The black board surface of this sign supply is a wood-substrate, and is meant primarily for indoor use. The sign supply can be used outdoors, however, we recommend bringing it inside during inclement weather. As with other wood-based products, the wood expands and contracts in different weather conditions. This may cause "checks" or imperfections in the wood. The "checks" in the wood are not noticeable from a distance, and with our affordable pricing, you won't find any other write-on boards that can compare. 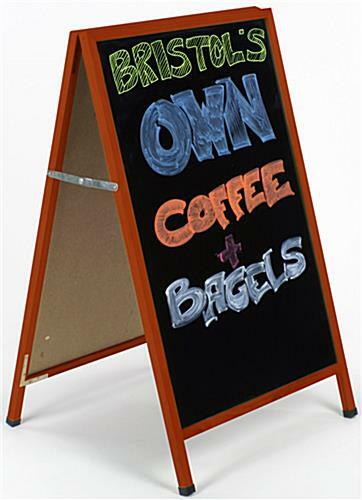 In addition, these sign supplies are meant for use with our neon wet-erase and liquid chalk markers. They are not meant for use with dry-erase markers, as these will leave a residue and not wipe clean. 26.5" x 43.3" x 26.0"